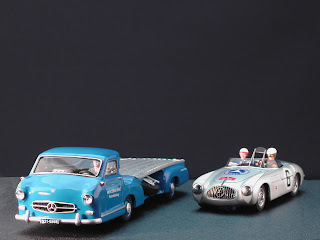 When I was a newbie to slot car, I used to watch foreign websites one after another every night. One day I hit the Mark Gussin’s page, I fell in love with his collections, especially this racing transporter. I was searching for it for 4 years or so, finally I got this in March 2009. I've been so lucky to have it since then and still feel happy.